Tools help monitor your Internet connection (release candidate). Is there a better alternative to IPNetMonitorX? Is IPNetMonitorX really the best app in Network category? Will IPNetMonitorX work good on macOS 10.13.4? 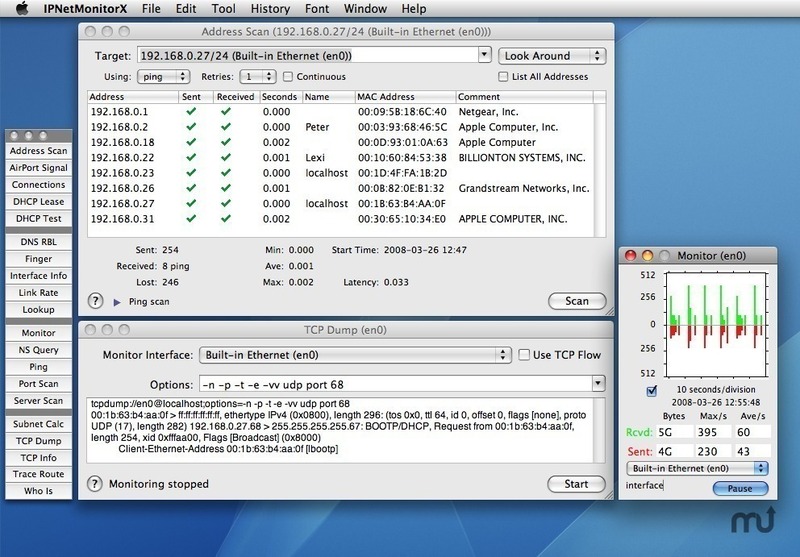 IPNetMonitorX is a powerful Internet/network troubleshooting toolkit for debugging Internet service problems and optimizing performance. Featuring 24 integrated tools, IPNetMonitorX is designed to help you quickly locate where the problem is and gather data which can be used to solve the problem either directly or through your Internet service provider. A complete Internet Toolkit. Consistent, integrated design affords speed and efficiency. Address Scan - update Ethernet OUI (Organization Unique Identifiers). Build with Xcode 10 on Mojave. IPNetMonitorX is notarized by Apple to work with Gatekeeper on future MacOS X. Upgrade price reduced to $20 (free if registered within last 2 years). A floating tool palette allows you to see and access the tools you need quickly. The layout of each tool is optimized for the task at hand. Comprehensive displays show TCP/IP in action, perfect for tuning network performance. Fast, asynchronous, multithreaded design allows you to see network behavior as it happens. Open and use multiple tools or instances of the same tool simultaneously from a single application. Input fields support recent targets or history, auto-completion, and drag-and-drop. Automatically transfers data from one tool to another. No need to login as root.